Grilling the rack (3 or 4 cutlets together) makes this barbecue lamb rack recipe so succulent and infinitely superior to grilling separate cutlets. Lamb is one of my favorite meats and I think that the balsamic vinegar in this bbq marinade really brings out the flavors. If this were fine dining then the start of the preparation would be to chine the rib bones (also called "French trimming") which basically means removing the meat from the end of the bone just leaving the eye of the chop. It might look pretty but think of the waste! So on this occasion I won't be chining the bones but if you do want to chine your bones for this or any other recipe for rack of lamb then this video shows you how to do it perfectly. 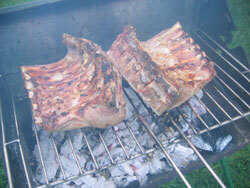 This barbecue lamb rack recipe involves a marinade which doubles up as a dressing albeit without the onion. The ingredients listing prepares enough for the marinade only. Using a balsamic vinegar marinade is a typical way of cooking lamb in many parts of Italy and I've enjoyed it many a time in a favorite restaurant of mine in Vasto, Abruzzo. For me, there is no better accompaniment than a glass of the local Montepulciano d'Abruzzo. Prepare the marinade by mixing the onion, vinegar, oil, lemon juice and honey into a shallow bowl and drop in the racks of lamb. The honey in the marinade will add a little thickness to the consistency and make it easier to brush on - marinade for a maximum of 2 hours and use a brush occasionally to make sure all the meat is getting the benefit. 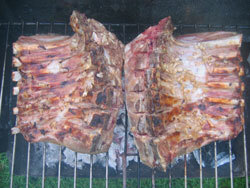 TIP - Seasoning the lamb with salt must be done just before cooking otherwise the meat will dry out. Don't be tempted to put any salt in the marinade because this will just toughen the meat, it's the citric acid in the lemon juice and the sugar in the honey that are the important tenderizing agents. 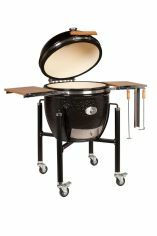 Hot coals are required, season the racks of lamb well with the salt and pepper and grill for 15-20 minutes turning occasionally. Feel free to add more marinade as baste though the cooking process. If using a temperature probe then look for a core temperature in the centre of the eye of 55°C or 130°F and you'll have perfect pink meat. Remove the racks from the heat and let them rest for 5 minutes. During this time the muscle will relax after the intense heat, the juices will be absorbed and the core temperature will rise by a few degrees further. Slice the lamb cutlets between the bones and lay over crisp lettuce drizzled in olive oil with a sprinkling of salt and wedges of lemon. To make some balsamic dressing just add the measures of balsamic vinegar, olive oil, lemon juice and honey together. Stir until you have a syrup. Don't forget the Montepulciano d'Abruzzo!